In 1941, during World War 2, the British Admiralty and War Office decided that more anti-aircraft protection was needed for London and Merseyside. 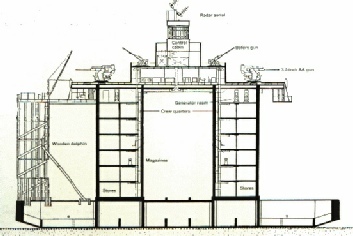 Amphibious forts were proposed as a solution and two distinctive designs were prepared by Guy A Maunsell, a prominent civil engineer engaged by the Government. 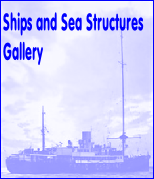 Maunsell’s designs were for four forts to be used by the Navy in the waters of the North Sea off the Essex coast and six forts for use by the Army, three in the Thames Estuary and three in Liverpool Bay. During World War 2 the sea forts in the Thames Estuary were credited with shooting down 22 enemy aircraft, sinking one E boat, badly damaging another and destroying 20-30 V1 flying bombs. There were also numerous rescue missions mounted from the forts for pilots who had been forced to ditch in the North Sea. These comprised a boat shaped reinforced concrete pontoon which carried two round towers topped by a steel deck housing armament and radar equipment. The forts were largely pre-fabricated and were constructed and assembled in a specially converted dry dock basin at Gravesend by Holloway Brothers Ltd. 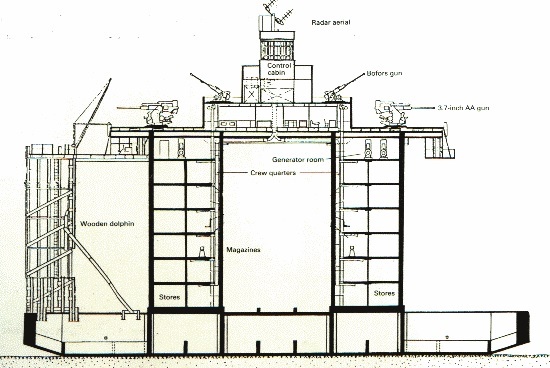 The two towers of the Navy forts each contained seven decks housing fuel, ammunition, water, generators and crew accommodation. The main deck had officers accommodation, while the Bofors deck had fresh and sea water tanks as well as ventilation equipment and the main gun defences. The Control Room was fitted with telephones, radio and early radar equipment linked by landline to a shore-based HQ. At the front of each tower was a lattice steel mooring platform, known as a dolphin, fitted with a crane used for loading supplies. When each fort had been commissioned and equipped it was towed by tugs to its grounding position with a full compliment of crew aboard. Once in position the hollow legs were gradually flooded with seawater until they sank to the seabed in an operation taking less than half an hour. The Army forts were designed to conform as far as possible to the format of a shore based battery, with emphasis on anti-aircraft defence. Each fort consisted of seven separate towers linked by catwalks, had four heavy and two light guns with a central Control Room and a searchlight position. The Thames Estuary forts were also built by Holloway Brothers Ltd at Gravesend, while the Mersey forts were built at Bromborough Docks on the Wirral banks of the Mersey. 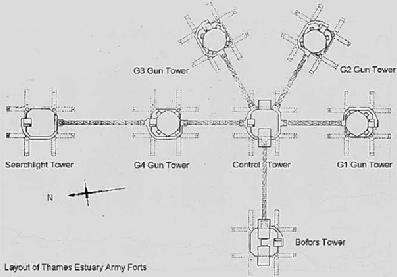 The fort complex as a whole comprised a central Control Tower surrounded by five further gun towers and a searchlight tower at the rear. Each individual tower had a base of reinforced concrete supporting four pre-cast hollow concrete legs, braced by a steel frame. The superstructure on top of the legs consisted of an octagonal building with 6mm thick steel plated walls, containing three decks. Each tower carried its own supply of fresh and sea water, while the Bofors Gun tower and the searchlight tower carried fuel supplies. All fuel and water supplies were linked by a network of pipes along the interconnecting catwalks. When built each tower was towed to its grounding position between two specially constructed barges and positioned on the sea bed by pumping compressed air into the hollow legs. 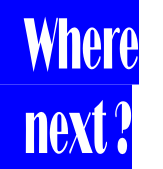 The first tower to be put in position was always the Bofors Gun tower which could then protect the others as they were lowered. The whole operation, including the installation of the interconnecting catwalks took several days to complete. The Mersey Estuary Army Sea Forts were never involved in offshore radio broadcasting (they were demolished in the early 1950s).